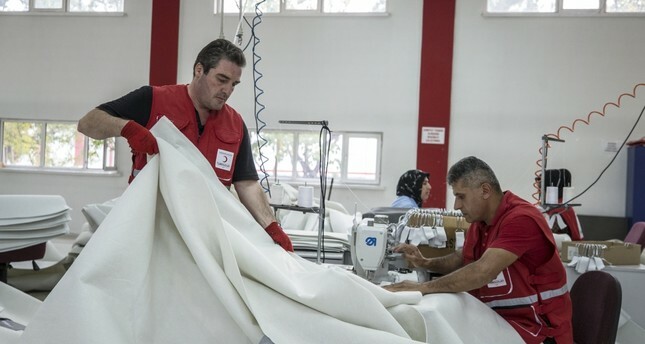 Workers sew tents at Red Crescent's factory in Ankara's Etimesgut district. The Turkish Red Crescent will build 8,000 tents for the International Organization for Migration (IOM), an intergovernmental organization attending to the needs of migrants. Tents will be used to accommodate about 40,000 migrants around the world. The Turkish charity, which marks its 150th anniversary this year, has manufactured tents for victims of natural and man-made disasters since 1954. Mehmet Eyyup Alper, who heads the charity's accommodation systems department, said they signed a supply agreement with the IOM and in the first stage they would build 5,500 tents. "We will build about 8,000 tents by the beginning of next year," he told Anadolu Agency (AA). Tents are being built in a factory operated by the Red Crescent in the capital Ankara's Etiemsgut district. Alper said that the charity plays an important role in responding to disasters in other countries and lately, they supplied accommodation and food aid for survivors in the aftermath of a strong earthquake in Indonesia that killed hundreds of people. "We have the capacity to build 400 tents daily," Alper noted. Tents differ from ordinary makeshift ones commonly used in disaster zones and consist of two layers. One layer is for air and to insulate against cold or hot weather with rainproof material consisting of a PVC roof and walls made of fabric. A second layer covers the living space.